Continuous bioprocessing is inevitably becoming the future of biomanufacturing. To date, several steps within a biomanufacturing process can be operated continuously. Upstream bioreactor perfusion systems, like the Xcell™ ATF (Repligen), produce a clarified harvest of monoclonal antibody (mAb) products—or other biologics—at a continuous rate within a sterile, closed system. These product harvests are often directly suitable for downstream chromatography steps. Downstream, continuous chromatography—enabled by multicolumn chromatography systems with sterilized, integrated flow paths—has made considerable advances. Systems suitable for GMP production are now available. However, to make a truly continuous process, from seed bioreactor to drug product, some missing links in the process still need to be developed and integrated. One of these links is connecting upstream bioreactors with a downstream capture step. A challenge in such an integrated, interconnected system is bioburden control. Again, the upstream half of the process is ahead of the downstream in this regard. Gamma-irradiated single-use bioreactors, and single-use gamma-irradiated filtration systems are already available. In downstream, sterility is harder to control, primarily due to complexities of chromatography systems. 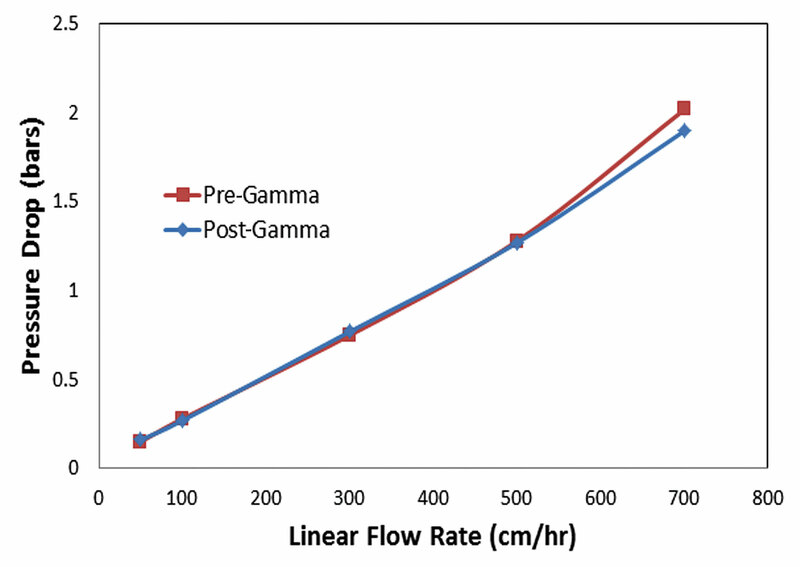 Newer chromatography systems with single-use gamma-irradiated flow paths solve part of this problem. The other unsolved part to this challenge is the lack of chromatography columns that meet this same standard of bioburden control. To date, the most common method in chromatography for bioburden control is chemical sanitization with sodium hydroxide. This is, however, not an ideal method for a continuous process that could run for weeks or months. The concentration and exposure time of sodium hydroxide required for complete inactivation of bacteria and spores is high, greater than 0.5 M sodium hydroxide with long exposure time of hours or even days. This approach is not viable within a continuous manufacturing strategy, due to time and stability constrains for even the most stable Protein A resins on the market. For that reason, a different bioburden control method is needed. The most accepted and reliable method is gamma irradiation. Solving the challenges of bioburden control in downstream column chromatography opens the door to having a completely closed system encompassing both upstream cell culture and downstream purification operations that can be operated continuously with low risk of bacterial contamination. A solution for downstream continuous capture is to utilize prepacked Protein A columns that can be gamma irradiated. Data are presented showing that gamma-irradiated prepacked columns are structurally stable, maintain functional performance, and can be operated in a closed system without bacterial contamination. A way to preserve functionality of Protein A from damaging effects of gamma irradiation is also presented. Opus® prepacked column components are made of medical-grade polypropylene and medical-grade silicone. Several tests were conducted to determine if column hardware could withstand sterilizing doses of gamma radiation while maintaining claimed pressure ratings. Irradiating empty columns with 25–30 kGy of gamma radiation didn’t change the tensile strength or elasticity of the polypropylene components, or of the silicone O-rings. The assembled column was pressure-tested, meeting the claim of ≥4 bar for an extended period of time. To evaluate if a packed bed will still be integral in performance following gamma exposure, a 20 cm i.d. by 20 cm bed height Opus column prepacked with agarose resin was gamma irradiated to 30 kGy. The packed bed performance measure by HETP, asymmetry, and pressure drop was maintained (Table 1 and Figure 1). Table 1. Packed bed performance of a 20 x 20 cm Opus column pre- and post-gamma irradiation to 30 kGy. HETP = height equivalence to the theoretical plate. The ultimate goal of gamma-irradiating purification columns is to control bioburden in a continuous, interconnected, lengthy bioproduction process. To test the effectiveness of gamma irradiation in eliminating bioburden, an experiment was set up including a gamma-irradiated column in a closed system. The column was aseptically connected to a bottle containing sterilized Luria broth that was recirculated within the closed system for 8 weeks. The broth was sampled weekly for sterility. All collected samples were sterile, indicating the system maintained sterility for the 8-week period. As a control, the recirculated broth was spiked with Escherichia coli to verify that it was favorable to bacterial growth, and growth was observed. The results demonstrated the capability of a gamma-irradiated Opus column in delivering the bioburden control needed for lengthy continuous processes. Figure 1. Pressure drop over a column pre- and post-gamma irradiation to 30 kGy as a function of linear flow. Protein A is the most commonly used capture step for mAb purification. Ionizing radiation, such as gamma, can severely impact a protein’s structure and function.1,2 A method that sterilizes the resin while maintaining the functionality of Protein A resin is critical. To study this, Protein A was immobilized to crosslinked agarose and gamma irradiated in several storage solutions. Following gamma irradiation, static binding capacity for polyclonal hIgG was measured and compared with a non-irradiated control sample. Static binding capacity was determined by incubating Protein A resin with a concentrated solution of polyclonal human IgG for 30 minutes. Afterward, the resin was washed with neutral pH buffer and eluted with low pH solution. The amount of IgG eluted was measured and static binding calculated. 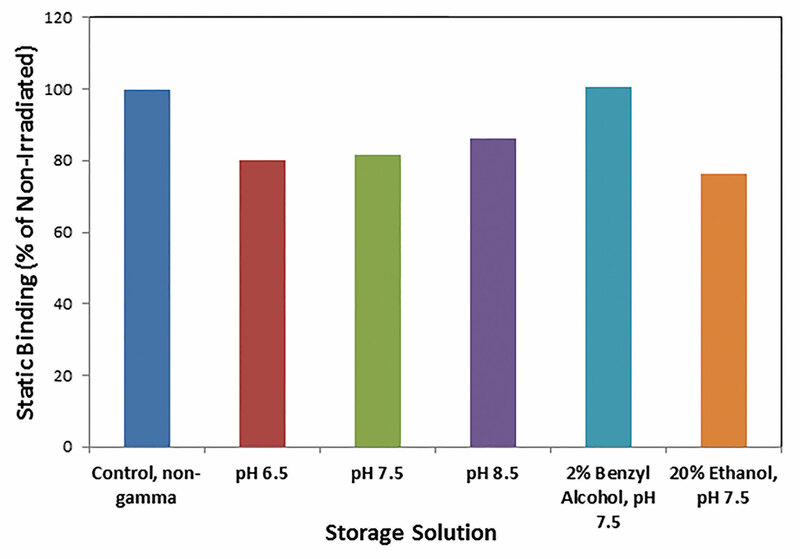 The Protein A resin irradiated in a solution containing 2% benzyl alcohol at pH 7.5 did not show3 a change in static binding capacity, while samples stored in other solutions had a capacity decrease of up to 24% (Figure 2). A mAb purification process operated continuously will require many column cycles; therefore, resin lifetime is an important consideration. While bioburden is controlled with gamma irradiation, cleaning of the column of other contaminants such as host-cell proteins and DNA is still necessary at regular intervals. The most used and preferred method of cleaning the capture column is sodium hydroxide solution at 0.1 M–0.5 M concentration. Even hydroxide-stable variants of Protein A will lose functionality in time after repeated or lengthy exposure to hydroxide. A gamma-irradiated Protein A resin should not be more unstable than a non-gamma-irradiated one. 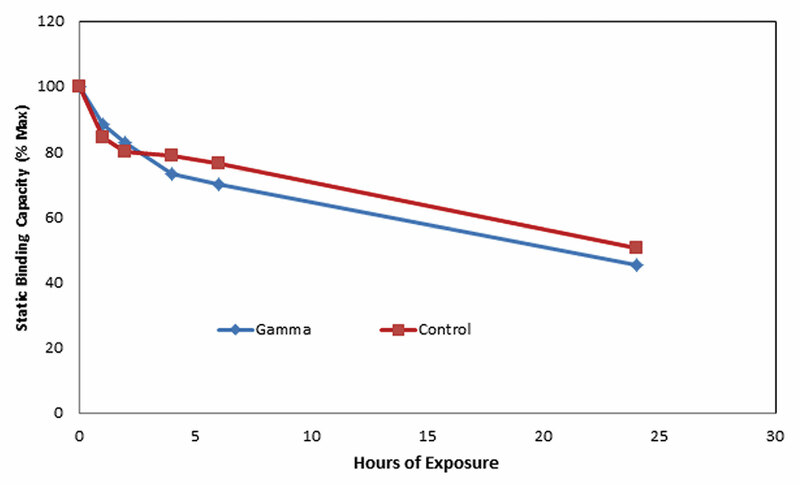 A study was performed to test the effect of gamma irradiation on hydroxide stability and overall purification performance. Figure 2. Storage solution effect on preservation of binding capacity of Protein A resin irradiated with 30 kGy of gamma radiation. Protein A resin stored in 2% benzyl alcohol, pH 7.5 solution was gamma irradiated with a 30 kGy dose. Results showed that gamma irradiation of a Protein A resin (according to this method) had a minimal effect on the hydroxide stability as compared with a control (Figure 3). Purification properties of the gamma-irradiated Protein A resin were maintained as demonstrated by similarity in the purity of the elution pool compared to the pool from a non-irradiated resin. It can be seen in Table 2 that the reduction in host-cell proteins (HCP) and DNA concentration was similar between non-irradiated and irradiated resin (30 kGy), the yield was also similar between the two samples. Leached Protein A, while slightly increased in the gamma-irradiated sample, was still within acceptable limits. The data presented herein demonstrate that Protein A resin characteristics can be preserved when gamma irradiating the resin stored in 2% benzyl alcohol, pH 7.5, leading to the conclusion that a prepacked Protein A Opus column stored in this solution and gamma irradiated to 25–30 kGy of irradiation can be suitable for the capture of mAbs. It is important to determine whether such a column can withstand many cycles of purification of a continuous process. Most importantly, a system that would run continuously will be able to maintain its bioburden-free status. A study showing the continuous cycling of a gamma-irradiated prepacked Protein A Opus column was conducted. A 1.2 x 20 cm prepacked Protein A Opus column stored in 2% benzyl alcohol, pH 7.5, was gamma irradiated to 30 kGy radiation dose. The column was aseptically connected to a perfusion bioreactor–ATF system surge bag. The clarified culture media coming from the bioreactor was loaded onto the column with the help of a peristatic pump, while the chromatography steps were executed using an ÄKTA™ Explorer (GE Healthcare) system fitted with sterile 0.2-µm filters on buffer lines. A sample collection manifold was attached to column outlet for daily collection and bioburden measurement. The column was run continuously for seven days. The results show consistency of purification between cycles, and most importantly the maintenance of a bioburden-free system (Table 3). There was a slight increase over time in leached Protein A, however, it was still within acceptable limits. Table 3. Consistency of purification of monoclonal antibody over gamma-irradiated Protein A Opus column seven days of continuous use. ProA = Protein A; HCP = host-cell protein. Finding solutions for bioburden control within downstream capture and purification steps allows for continuous processes to be adopted more easily. A sterilized, prepacked Opus chromatography column can be aseptically connected to a continuous upstream perfusion bioreactor—Xcell™ ATF system—and biological products can be directly and continuously captured and purified. Gamma sterilization of prepacked Opus columns does not affect the physical integrity of the columns. An appropriate storage solution allows preservation of the properties of Protein A capture resin upon treatment with gamma radiation. Sterility is also maintained over an extended period of continuous use. The Protein A capture step is probably the most critical, yet sensitive (due to relative fragility of Protein A) step in the downstream purification of mAbs. Demonstrating that a prepacked Protein A Opus column can be sterilized with gamma irradiation and successfully integrated in a closed upstream-downstream unit opens the door to an integrated continuous biomanufacturing process. Further downstream chromatography steps could be gamma irradiated for bioburden control, and a truly closed, fully integrated unit could continuously produce biological drugs. Figure 3. Loss of binding capacity of gamma-irradiated Protein A resin exposed to 0.5 M hydroxide compared with non-irradiated Protein A resin. Dana C. Pentia, Ph.D. (dpentia@repligen.com), is senior scientist, downstream bioprocessing, and James R. Peyser (jpeyser@repligen.com) is senior director, bioprocess development, at Repligen.